Read more about our infrastructure and funding programs, and targeted strategies. Create NSWs Arts and Cultural Development Program (ACDP) provides funding opportunities for NSW-based arts and cultural organisations, NSW professional artists and arts/cultural workers across a wide range of artforms and disciplines. Create NSW is offering six grants of up to $20,000 each for professional artists to develop virtual reality and augmented reality work. The Western Sydney Strategic Funding Program invests in programs that provide opportunities for artists and cultural practitioners, and arts and cultural organisations based in Western Sydney. Expressions of Interest are NOW CLOSED. Create NSW is calling for artists to register their interest to develop artworks for seven new Sydney Metro railway stations. Internships opportunities to practitioners with disability. Organisations offering small grants or devolved funding programs within specific artforms and with the community. The Regional Cultural Fund supports arts, screen, cultural and heritage infrastructure for communities in regional NSW. Funding opportunities offered by other NSW Government organisations. The NSW cultural institutions manage significant cultural heritage collections and provide services and programs throughout the state and beyond. These companies have a commitment to excellence in performance, and to engaging in new and creative ways of entertaining and inspiring people. These festivals provide Sydney with periods of concentrated cultural activity, attracting audiences of over two million people annually. NSW is home to leading visual arts organisations; these organisations influence the development of contemporary visual arts and craft practice in our state. Create in NSW is a ten year framework for contemporary NSW. It sets a vision for a future in which arts and culture are central to the life of our State. Here you'll find guides and resources to help generate revenue for your creative practice. Advice for artists and creative workers making a living through running a small business including sole practitioners, small groups, partnerships or cooperatives. On these pages you can view various Research and Statistics material from Create NSW and beyond. Nicole Monks lighting gawura guruwin Whale Shark Ceremony at Tamarama Beach 2018. Photo by Jessica Wyld. Nicole Monks was a recent recipient of a Create NSW Aboriginal Artist Support (Quick Response) grant, which supported the artwork gawura guruwin (whale shark) – a collaboration with Uncle Charles Madden, Teresa Gay, Kristine Townsend and First Nation community members (Nhurra) – that was selected for Sculpture by the Sea this year. The sculpture was inspired by a rock engraving found near Mackenzies Point, Tamarama. Nicole spoke with Create NSW about celebrating the mysteries of the whale shark. How does it feel to have your work selected to be part of this year’s Sculpture by the Sea? It was a real honour to be selected for such a prestigious international sculpture exhibition. However, the most important element about being included was the opportunity to create community on a large scale. It was really special to bring First Nations mob together to create an artwork that brought people from all over Sydney and NSW to share an elemental connection to country right here on Tamarama Beach. As a recipient of the Aboriginal Artist Support Quick Response fund, do you have tips for other artists who may be thinking of applying? It’s not easy money, it’s hard work, so set aside a lot of time. Especially for the budget. Ask for help from those that have been successful in the past, and ask the Create NSW team questions, they are there to help. Can you tell us about your work, gawura guruwin (whale shark), and what inspired you to create it? Uncle Charles Madden (Gadigal Elder) and gawura guruwin collaborator – has always been a huge inspiration to me. The Sculpture by the Sea exhibition area includes a magnificent whale shark engraving on the headland, as confirmed by Elder Allen Madden (Gadigal Elder). This was extremely interesting to me as the whale shark is from Yamatji, near my mob’s country in Western Australia. A whale shark beached itself on Bare Island, La Perouse in the 60’s and then in 2011, there was another sighting of a whale shark in the same area. We then connected with the broader story of these magnificent creatures which brought up more questions. How old is the rock art? How long have these whale sharks been coming here? Did they come here to tell us something? We collected the living memories of the whale shark, from scientists, to the divers and even the first hand account of the whale shark beaching itself on Bare Island. This can be listened to while sitting in the centre of the artwork on the beach during Sculpture by the Sea. Can you tell us about how your collaboration with Uncle Charles Madden, Teresa Gay, Kristine Townsend, Charlotte Hilder and First Nation community members (Nhurra) came about? The artwork began privately by giving our respects silently to those who had sat out on the headland and looked over these waters, connected with the whale shark and engraved the headland. Uncle Charles Madden redrew the original rock art. It was important to have a respected Elder to recreate this image. 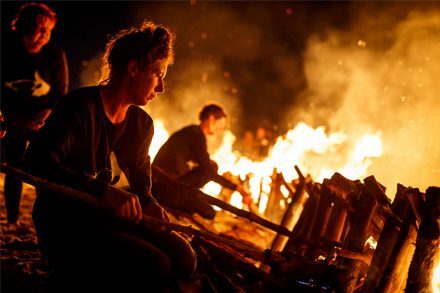 Teresa Gay shared her stories of growing up and of the La Perouse Bonfire and firecracker night, which became the catalyst for the fire element of the work. Kristine Townsend is a true bush woman, and she collected all the native timbers from Wiradjuri country, her mob’s country. Charlotte Hilder managed the project that brought the community together on Tamarama beach. We also sought permission from the La Perouse Local Aboriginal Land Council to have a small private First Nations fire adjacent to the original rock art. Is there anything else you want to share with us about the artwork? This work has taken months in the preparation. From collecting of timbers, days to build on site in inclement weather and just hours to burn. I would like to thank all the people who came together to make this a reality, in particular Sculpture by the Sea, 107 Presents, Clitheroe Foundation, The City of Sydney, Create NSW, Finsbury Green, Solid Ground, The Tudor Hotel, East Coast Wildflowers, Jamie Gray, Ashes to Ashes, Uncle Max, Adam, Adam, Matt, Phil, John, Crowie, Matty, Ilford locals and the Stargazers and most importantly the Community. Find out more about Nicole Monk’s gawura guruwin (whale shark) Sculpture by the Sea artwork here. Jonathan Jones on identity, language and developing a greater cultural understanding through his craft.